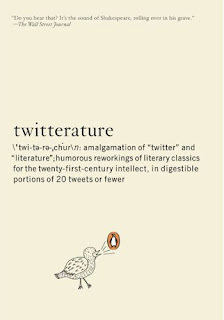 Booklicious: Win a Copy of Twitterature! Win a Copy of Twitterature! We here at Booklicious are getting into the Christmas spirit, and so we're giving away a copy of the upcoming Twitterature: The World's Greatest Books in Twenty Tweets or Less to one lucky reader (located in the U.S. or Canada). To enter, send an email with "Twitterature giveaway" in the subject line to bookliciousblog [at] gmail [dot] com with your name and mailing address. You have through this Friday, Christmas Day, to enter. We'll use the magical Randomizer to pick the winner, who will be announced on the blog next Monday. This Wednesday we'll review the book, which goes on sale December 29.